Halloween is fast approaching and as per usual there are hundreds of horror titles released just in time for 31 October. From terrifying TV boxsets via creep classics and nerve shredding new releases, we pick our ten favourite fright flicks coming your way for Halloween 2016. An official continuation of the Evil Dead saga. Set 30 years after Evil Dead II, the deadites have been released from The Book of The Dead. 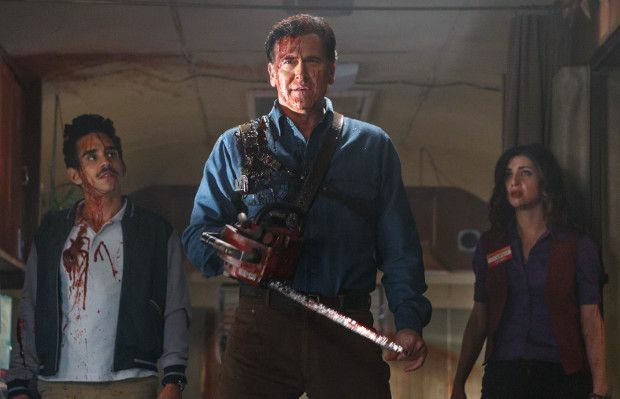 Once again, self-centred 'hero' Ash (Bruce Campbell) is all that stands between the world and demonic annihilation. An absolute blast from start to finish, each 30 minute episode plays like a goofy, super violent sitcom. Groovy. Another film series heads to TV. A tense cat and mouse game over six episodes as Eve (Lucy Fry) hunts serial killer Mick Taylor (John Jarrett) across the Australian outback after he slaughters her family. An edgy, gripping thriller with a strong performance from Fry, while Jarrett is suitably, gruff, menacing and terrifying. Not as nasty as the original film but far more satisfying that the sequel. Classic cannibal horror from Wes Craven (A Nightmare on Elm Street / Scream). A family are besieged by inbred desert dwelling mutants with a hunger for human flesh. A brutal, gruelling thrill ride, now available in 4K for the first time. Director Nicolas Winding Refn (Drive) has described The Neon Demon as a 'teenage horror film about beauty' but it's more arthouse than scary movie. Elle Fanning plays an innocent young model who moves to LA where she's drawn into a weird world of manipulation and obsession. Cold, aloof and hyper-stylised, The Neon Demon is perhaps the most starkly beautiful film of recent years. Five carnie workers are kidnapped and forced to fight for their lives as they are attacked by psychotic clowns in this bloody reworking of The Running Man. Features everything you've come to expect from a Rob Zombie film: a sleazy 70s vibe, cult actors (inc Malcolm McDowell and Meg Foster), a cool retro rock soundtrack, his wife (Sheri Moon Zombie) in a lead role and lashings of violence. Dutch slasher, with a mainly British cast terrorised by a clog wearing scythe wielding maniac. It's pretty silly but a lot of fun with some cool gory murders. Anthology with a series of short horror films based on specific holidays (including Valentine's, Easter, Christmas and Halloween) from a variety of horror directors such as Kevin Smith, Scott Stewart (Legion), Nicholas McCarthy (The Pact) and Gary Shore (Dracula Untold). Inevitable the quality varies but there are a couple of excellent quick fire scares on offer (surprisingly 'Father's Day' is the strongest entry). Don't get too excited: this is the 1978 TV movie version of Marvel's spookiest superhero, not the upcoming Benedict Cumberbatch version. Despite the obvious budgetary limitations there's a lot to enjoy, with spirited performances from John Mills, Jessica Walter and Stephen Hooten. It plays like a kooky mash up of Starsky & Hutch and Hammer Horror. This Chilean horror finds two mountain bikers caught up in weird occult rituals and sticky body horror nastiness. Parker (Lindsay Farris) is hired to watch a young woman. Staked out in a crappy apartment across the road, things take a supernatural turn in this creepy low budget Rear Window.